We offer complimentary consultations. 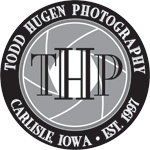 Book one today to learn about Todd Hugen Photography and what sets us apart from the rest. We’re open by appointment only and we’re located just southeast of Des Moines along the Highway 65 bypass.